Happy February! With a new month comes new tips from your friends at Hutcheson Horticulutal. Check out some things you should be doing in the month of February. Begin Pruning Crape Myrtles – February is the best month for this as the tree should be completely dormant at this point. 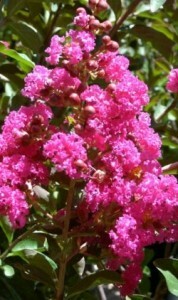 Crape Myrtles begin to go dormant in December, but it takes a few months for them to complete the process. You will want to prune them when they are dormant so you can better see the structure and frame of the shrub. Complete leaf removal from shrub beds and turf area – this will prepare them for spring growth. Cut back Roses as needed. Apply pre-emergent to turf and planting beds to better control spring weeds. Install Balled and Burlapped trees and shrubs – now is the best time because February is the end of the dormant season for many plants. By planting them now, they will experience the full growing season in the spring. Happy planting, and pruning, Woodstock!